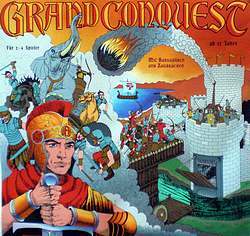 Grand Conquest takes the Conquest game to a whole new level, adding Castles with Drawbridges, Camels, Catapults, and Siege Engines. It also introduces movement in the fields between the standard playing positions. Additionally, new units can be built by paying moves. The board is printed on both sides, with a 4-Player version on one side and a 2-Player version on the other. The 4-Player version can be played as a free-for-all or as a partnership game. The game comes with a puzzle book which helps teach strategy, in the same format as chess problems.